King Bot must find his way back to his castle, but the way is littered with obstacles. Can he avoid the evil wizard who confuses the way, travel through the enchanted forest avoiding the elusive troll and dragon, slide past the nasty witch without being delayed, explore the dark cave and escape without harm, and slay the giant dragon without running away in fear? You never know which way this little robot king is going to go because he has a mind of his own! Play over and over with different outcomes each time. 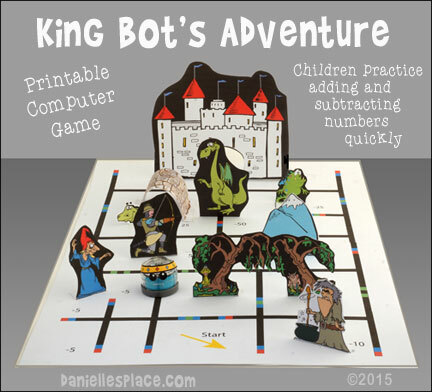 Children add up the points to see whose robot king can accumulate the most points while making his way back to his castle. This game is a way for children to practice adding and subtracting by positive and negative numbers. Teachers can write different numbers on the game board to practice different math facts. 1. Print out the Game Pieces, Game Board Pieces, and directions onto cardstock and cut them out. Cut the end off one printed game board so that they overlap without a white gap. Glue the boards together with rubber cement and tape the back all the way across the middle of the board where they overlap. Color the cave pattern to look like rock on the side indicated on the pattern. 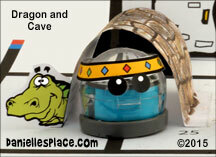 Fold the tabs on the sides of the cave pattern and the dragon towards the colored side. 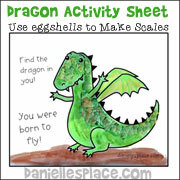 Score the fold on the front and back of the dragon with a sharp object, and then fold back the tab. Glue it to the game board where indicated. 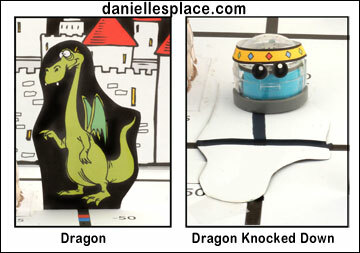 When the glue is dry press the dragon down flat on the game board and use the black marker that comes with the Ozobot set to draw a line on the back of the pattern to match up with the line that leads to the dragon just up to the perpendicular line that crosses underneath the dragon. Cut out the pattern making sure to cut very closely to the branches that overhang in the center of the trees. Fold and unfold the hanging branches to make them bendable. Experiment with the ®Ozobot to see if it can pass under the branches without getting caught. Fold up the tabs on the other game pieces and glue them to the game board where indicated. Cut out the crown and glue it into a circle shape. Place a tiny rolled up piece of tape on the inside back of the crown so it will stay on the ®Ozobot's head. Ozobot is a registered trademark of Evollve, Inc.
"The Bog Baby", a fanciful book about a little blue creature that appears after storms, will appeal to children of all ages. 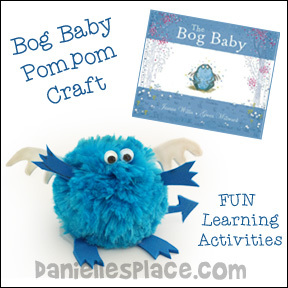 This book not only pricks the imagination of readers, but encourages them to use their imagination to write notes about their own bog babies, and suggests other creative activities to go along with the story. 1. 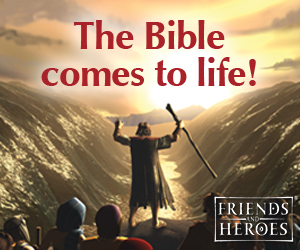 Read the story of "The Bog Baby" to your children. Ask them to describe what the Bob Baby looks like. 2. 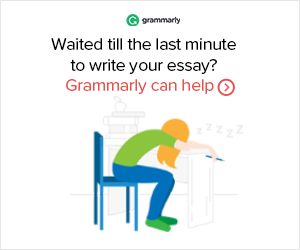 Give them each a pompom, wiggle eyes, and construction paper. 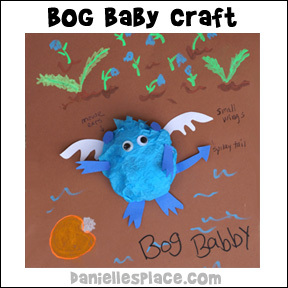 Tell them to make their own versions of the Bog Baby or make one that looks like the Bog Baby in the story. 3. 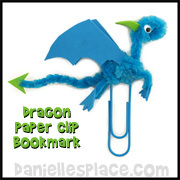 Draw the wings, tail, feet, and arms on construction paper, cut them out and glue them to the pompom. 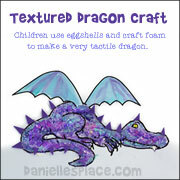 Check Jeanne Willis' website for even more creative ideas to use with this book. The little girls learn that If they really loved something the Bog Baby, they had to do what was best for him, no matter how much it hurts them. That was real love. So they let the Bog Baby go back where he belonged.